51/0/20. Favorite of PvE pally's and PvP 5's teams. 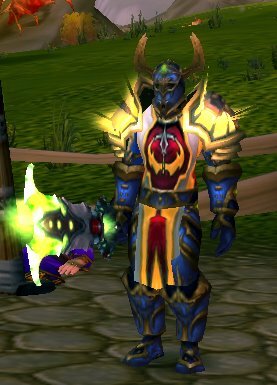 The major thing here is Beacon of Light for those of you completely oblivious to pally talents. I would love to keep this spec up because it's the default PvE spec, and that means I could run some heroics and even 25 mans as holy. Thus giving me access to some of those sweet tier 7.5 drops. Sadly (because I don't play a 5's team) it's not to be. The way it works - Same play style as the 49/0/22 build but with the beacon. In 2's place the beacon of light on the player you don't expect to take the brunt of the damage. That's because the beacon will not be healed for overhealing. SO if my rogue was healed for 1k plus 5k overheal I would only receive the 1k in healing as the beacon. So when I'm playing with my Rogue, Beacon is on me. Whenever I heal up my rogue partner I get the same amount of healing. In 3's it depends on the partner. If it's not a plate wearer I'll put it on them. If they do wear plate and have good resilience I'll put it on myself. The problem here is that I no longer have Divine Purpose, which means I'm stunned easily. This costs me the game waay to much. A rogue will keep me in stunlock a mage will keep me on ice, etc etc. To me it feels like this build HAS to have a 2nd heal target available because you spend more time catching up in heals thanks to all the stuns; rather then anticipate the heals needed. And forget about any cleansing, when you finally get out of that blind/fear/sap/etc you'll be throwing up an instant holy shock followed by a Holy Light just to keep your partner at 1% health from dying - even as you hear I need a heal NOW! what the hell have you been doing the last 10 seconds?!? thru your vent. Believe me, letting your partner know how you were locking in a CC chain for half the fight is as frustrating to hear as it is to explain. This build shines in 5v5 combat where you're effectively healing 2 people at once - it's so hectic none but the best teams will have good CC chains and as a plate wearing healer you're not going to be the first target (usually).